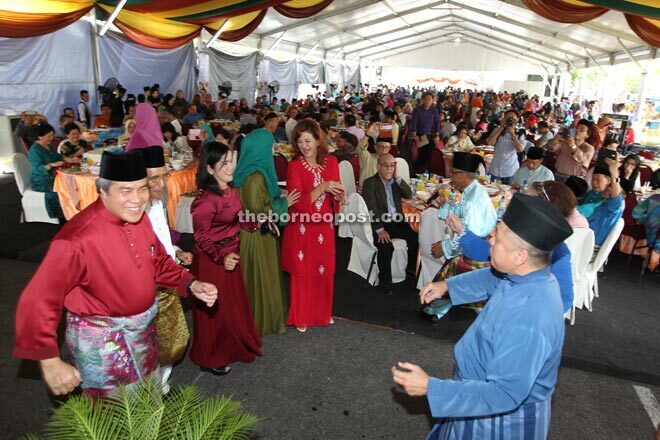 Awang Tengah joins in a traditional Malay dance together with other guests. KUCHING: The state’s export of timber products has decreased by 12.3 per cent in the first half (January to June) of this year compared to the same period last year. According to Second Minister of Resource Planning and Environment Datuk Amar Awang Tengah Ali Hasan, RM3.2 billion was recorded in the first half compared to RM3.6 billion in the corresponding period last year. “In general, timber products suffered from weak demands this year,” he said at Sarawak Timber Industry Development Corporation’s (STIDC) Raya celebration held at Wisma Sumber Alam here yesterday. Nevertheless, Awang Tengah, who is also STIDC chairman, said that plywood remained as the state’s main timber product. “The export value for plywood is RM1.6 billion or 50 per cent of the total export value of timber products,” he said, adding that Japan, India, Middle East, Taiwan and Korea were Sarawak’s main markets for timber products. Meanwhile, the Raya celebration saw around 500 guests comprising staff as well as representatives from the corporate sector attending the event. Awang Tengah’s wife Datuk Dayang Morliah Awang Daud, Assistant Minister of Assistant Minister for Industrial Development (Investment and Promotion) Datuk Julaihi Narawi and STIDC general manager Datu Sarudu Hoklai were also present.